What do you do when you can’t sleep? Some people count sheep, but that sounds boring. One coworker, whom I now hate more than ever, revealed that he just lies there and thinks “about how chill and generally good [his] life is.” This does not apply to most of us. Another coworker says she thinks “about everything that stresses [her] out until it’s time to wake up,” which is easy and tempting but doesn’t actually achieve sleep. No, oblivion-seeking friends, allow me to recommend: the murderer. This is how it works: You find yourself unable to silence your mind, and subsequently, unable to settle your body. You toss and turn and you stare at the clock and at your ceiling, and maybe you grab at your cell phone. You will never fall asleep this way. So you imagine a murderer lurking, staring at your bed-clothed lump, but unsure whether there is a living, breathing, potential victim under there. If you move, he will see you. If you open your eyes, he will kill you. So you lie still. You breathe deeply, slowly, evenly. Eventually, sleep comes. I’m not alone! I confessed to my co-workers that I do that too. They looked at me like I’m nuts. But that can’t be, because there are two of us. At least two of us. There should be more of us. You should try the murderer. It’s not really a secret how the murderer works, nor a surprise that it does. We already know that the brain takes cues from the body when falling asleep—because the blood vessels in the extremities naturally dilate with the onset of sleep, you can induce the onset of sleep by reversing the order, and warming your hands and feet. Similarly, you can skip right to sleep’s physical immobility by forcing yourself immobile—the mental stasis will naturally follow. But how to get immobile when your mind is still racing, from the stress of the day, or that late cup of coffee, or the knowledge that, oh my god, life is a never-ending sequence of living nightmares? If you’re like me, you can be tricked into it. Just as my parents used to get young me to shut the hell up by challenging me to a “who can stay quiet the longest” contest, picturing a looming murderer can be enough to trick me into respecting the few minutes of self-paralysis required to let my mind exhaust itself without external stimuli. It can be fun, too. Whoops, an itch on my arm! Can I wait it out without scratching? Because, you know, the murderer. 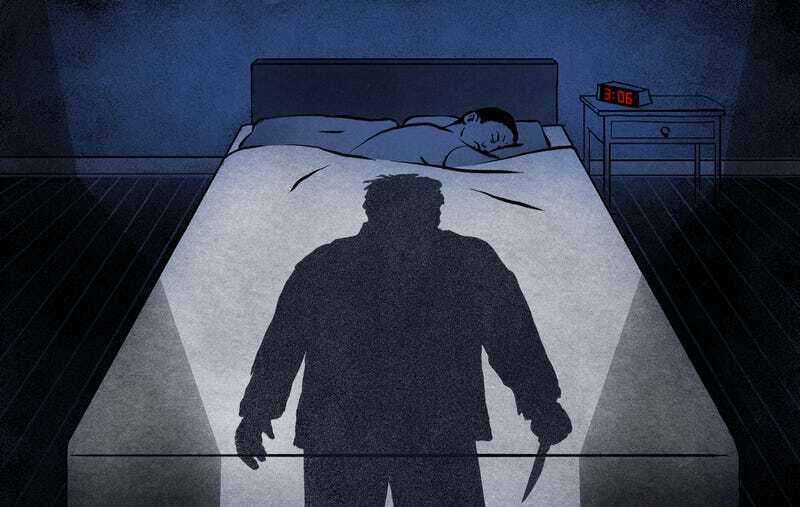 Maybe a murderer is too intense for you, and not conducive to a pleasant night of sleep. Sometimes I like to employ the burglar. He is outside my apartment, peering through the window. He can see my bed, but I’m so still that he can’t tell if anyone’s home. If I move, he’s going to break in and make me tell him where my stuff is. (I realize this burglar operates on the opposite principles of most burglars, but this is how it goes.) The burglar can be good because I do live on the ground floor, so his existence is entirely plausible. Why, if I dare open my eyes, perhaps I’ll see a real burglar peering back. Better not open my eyes! Maybe the sense of danger is less real if you go supernatural. Go with old reliable, the closet monster—it’s worked for children for generations. The point is, stillness can be frustratingly elusive, and whatever works for you works for you. Mine happens to add an edge of danger and excitement to the process of falling asleep, and thus an extra layer of safety and comfort to the bed itself—and there is no place that should feel more welcoming. Try the murderer. *Important information to consider before trying the murderer: I am tired pretty much all the time.